Congress Faces September Deadline For Funding Kids' Insurance : Shots - Health News The popular Children's Health Insurance Program is up for renewal Sept. 30. Policy analysts say it's unclear whether a deeply divided Congress facing major deadlines will get the job done. The Children's Health Insurance Program relies on money from state and federal governments to help subsidize the cost of medical care for some kids not poor enough to qualify for Medicaid. But with a deeply divided Congress, some health advocates fear that the Children's Health Insurance Program could be in jeopardy or that conservative lawmakers will seek changes to limit the program's reach. Other financial priorities this month include extending the nation's debt ceiling, finding money for the Hurricane Harvey cleanup and keeping the government open. "With all that is on Congress' plate, I am very worried that a strong, wildly successful program with strong public support will get lost in the shuffle and force states to begin the process of winding down CHIP," said Bruce Lesley, president of the advocacy group First Focus. The program covers more than 9 million kids — typically from families not poor enough to qualify for Medicaid, the state-federal program that covers health care for people with low incomes. Income eligibility levels for CHIP vary widely among states, though most set thresholds at or below 200 percent of the poverty level — about $49,000 for a family of four. Unlike Medicaid, CHIP is usually not free to participants. Enrolled families pay an average premium of about $127 a year. Since CHIP's enactment, the share of uninsured children in the U.S. fell from 13.9 percent in 1997 to 4.5 percent in 2015, according to the Medicaid and CHIP Payment and Access Commission. The 20-year-old program has bipartisan support. One of its original sponsors is Sen. Orrin Hatch, R-Utah, chairman of the Finance Committee, which has scheduled a hearing on reauthorization Thursday. It's possible in the jam-packed legislative calendar this month that other health-related provisions could be attached to a CHIP reauthorization bill — such as Republican-sponsored changes to the Affordable Care Act. Those changes could keep the resulting bill from getting enough support from Democrats and some Republicans in the Senate for passage. "It's the only vehicle in health care policy other than the federal budget that's going to be moving, so it's likely extraneous items are likely to be added to it," says Christopher Pope, a health policy researcher and senior fellow at the conservative Manhattan Institute. Supporters of CHIP also worry about changes in eligibility for the program that could dampen enrollment. The Affordable Care Act bumped up federal funding of CHIP by 23 percentage points and forbids states to restrict eligibility rules that were in place in 2010. Both of those requirements continue through September 2019. The added funding means a dozen states have their entire CHIP programs paid for by the federal government. In the fiscal year that ended last September, states contributed less than $2 billion, compared with the federal government's $13.6 billion contribution, according to the conservative Heritage Foundation. States should pay a higher share of the program's costs, the foundation argues. President Trump's budget request this spring called for immediately eliminating the ACA bump in funding and ending the restriction on a state's ability to curtail eligibility — often referred to as the "maintenance of effort" provision. 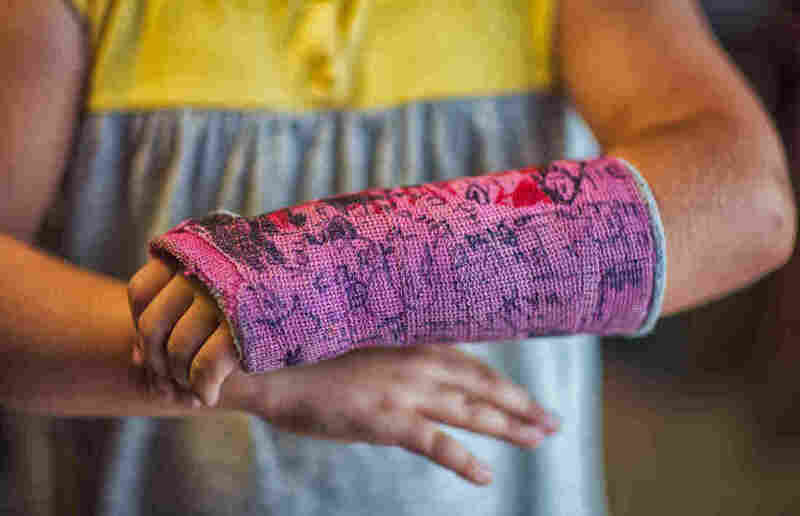 But that provision has kept CHIP stable at a time when the individual insurance market faces uncertainty, says Joan Alker, director of Georgetown University's Center for Children and Families in Washington, D.C. Advocates note that if children have to leave CHIP and move to marketplace coverage, their families may be forced to pay higher out-of-pocket costs for their kids' health care. Without the maintenance-of-effort requirement, advocates fear that states would be more likely to do what Arizona did during the last economic downturn: It froze enrollment from December 2009 until last June. The move was allowed because it took effect before the ACA's restriction began in March 2010. Meanwhile, Republicans are not united in their views of the maintenance-of-effort requirement. Some favor it because, they say, it shifts more authority of the program to states. Others say it would very likely lead some states to move many CHIP enrollees into either Medicaid or private insurance policies sold on the Obamacare exchanges — both areas where the federal government may pay an even higher share of the costs, Pope says. "It's not a simple win for anything, but you can see why some governors would like it," he says. At a House subcommittee hearing in June, some Republican lawmakers expressed concerns about extending the enhanced federal funding for CHIP. "This increase in funding has challenged the program by both shifting the nature of shared responsibility of the state Children's Health Insurance Program to the federal government and making states more dependent on federal dollars," said Rep. Michael Burgess, R-Texas, who heads the Energy and Commerce subcommittee on health. A committee staff memo prepared for the hearing suggested that taking away the extra funding (as some Republicans would like to do), but leaving the maintenance-of-effort requirement in place, would not result in fewer children having coverage. Without renewal of the program, Arizona, Minnesota, North Carolina and the District of Columbia would run out of their federal CHIP funding by the end of this year. By March 2018, an additional 27 states would exhaust their funds. Minnesota and D.C. officials say all children in those two regions who are covered by CHIP will transition to Medicaid if the federal funding is cut. Alker says the enhanced funding included in CHIP's 2009 reauthorization has helped several states, including Nevada and Utah. The states were able to expand coverage to legal immigrant children immediately; before that extra money came in, these kids faced a five-year wait for insurance. Given the complexity of making major changes and the tight congressional timeline, some experts say Congress may opt to pass a clean CHIP bill — without major changes to the program. "Congress is in [session] this month so few days that I can easily see CHIP simply being reauthorized without strings attached," says Joe Antos, a health economist with the conservative American Enterprise Institute. Lawmakers' attention is more likely to focus on the debt-limit deadline, the budget resolution and tax reform, Antos says.